We had some glorious days in Glacier Bay, but it was time to leave and look for new adventures. 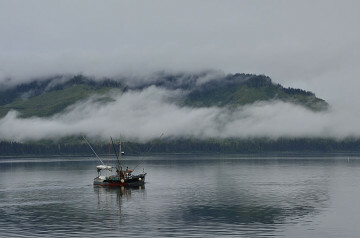 Hoonah is a good place to stop – it’s not too far from Glacier Bay National Park and we pass by some prime whale feeding spots on the way. We were just in Hoonah a few weeks ago, but we were quite happy to return to see if there was any action in the eagle’s nest (none) and to visit the wonderful Tlingit carvers. Throw in lunch at Chipper Fish and it’s a great day all around. Just as we sat down to wait for our lunches to come out, a great kerfuffle erupted on the street and a crazy parade trooped right by the window of the restaurant! It was the New Old Time Chautauqua performing group! We had read about them visiting Petersburg after we left, and we were sad to have missed them… so here was our chance! 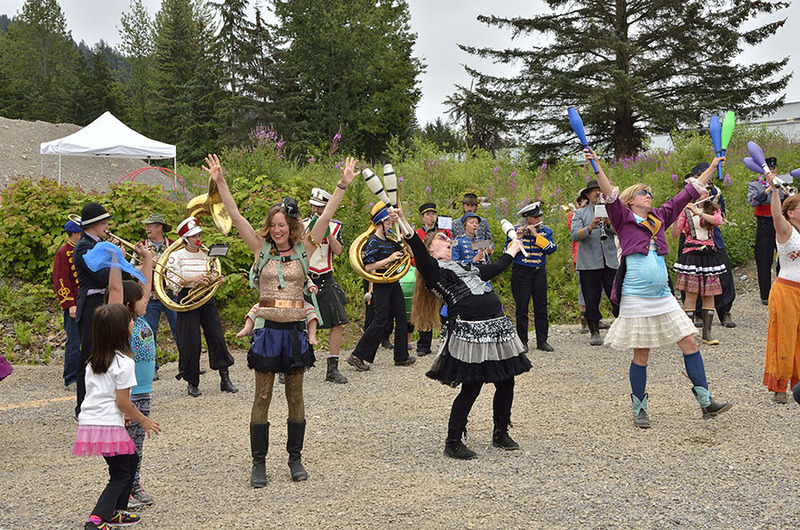 This group is all-volunteer who tour around various parts of the Pacific Northwest each summer, performing, amazing, and entertaining children of all ages. 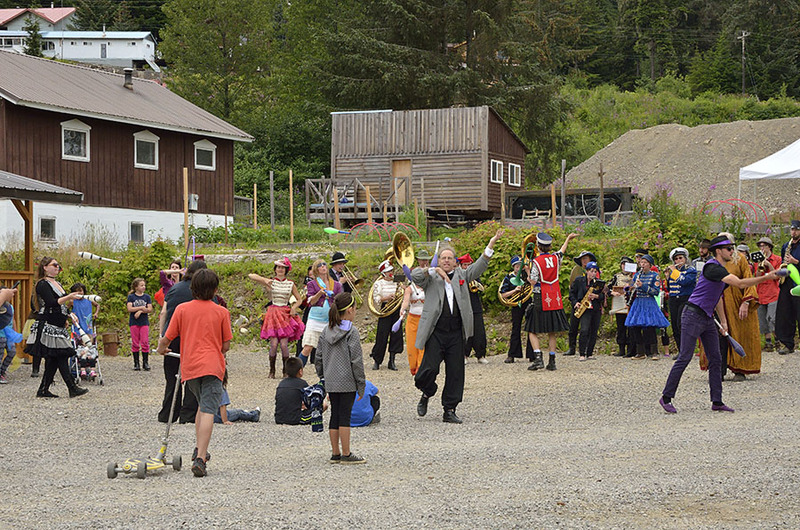 The community had a pot-luck dinner for the performers, and the Hoonah Tlingit did some traditional dances to return the favor. We enjoyed the parade and sample acts, and we joined the townspeople in the high school gym that evening to watch the full show. Wonderful, fun, and funky! 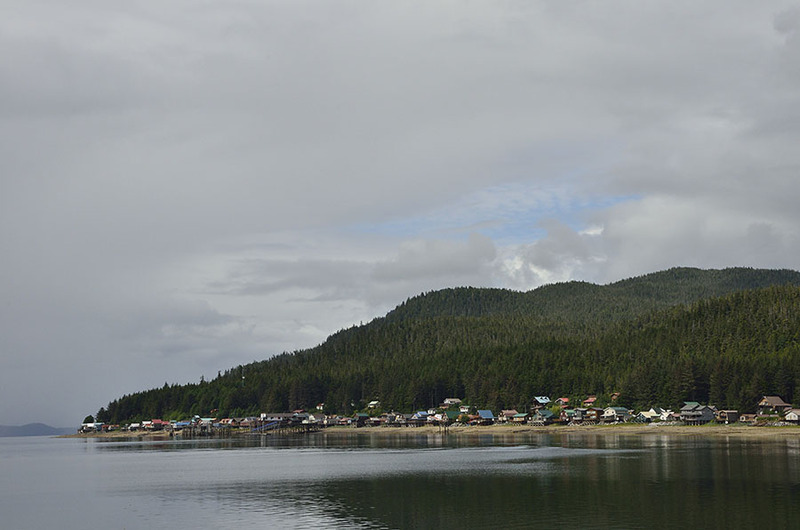 It was nice to have some cell phone service and a little Internet to catch up on the world before we headed back out into Chatham Strait to check out new place for us – Tenakee Springs. 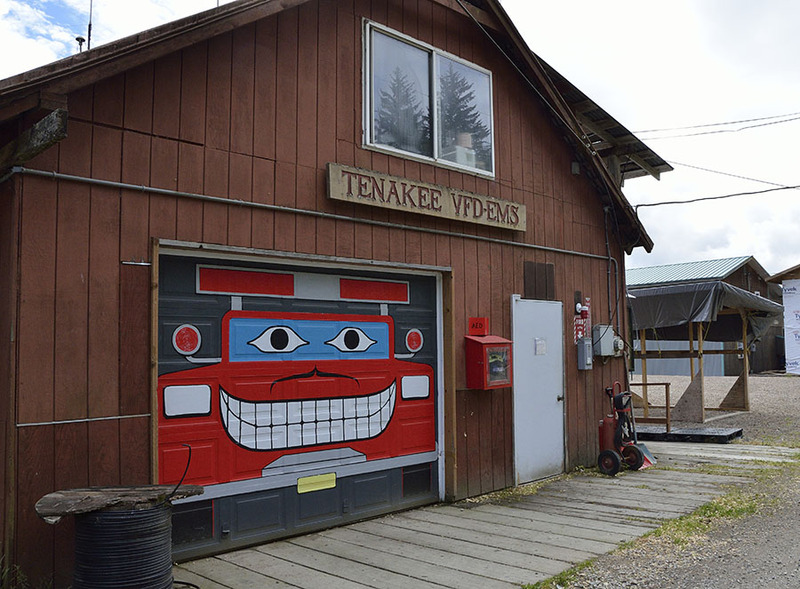 Tenakee is a very small community with about 65 people who live there year round, and it’s known for its hot springs. The hot springs are piped into a bath house building, and the community decided to organize things so there are set hours for men and women. 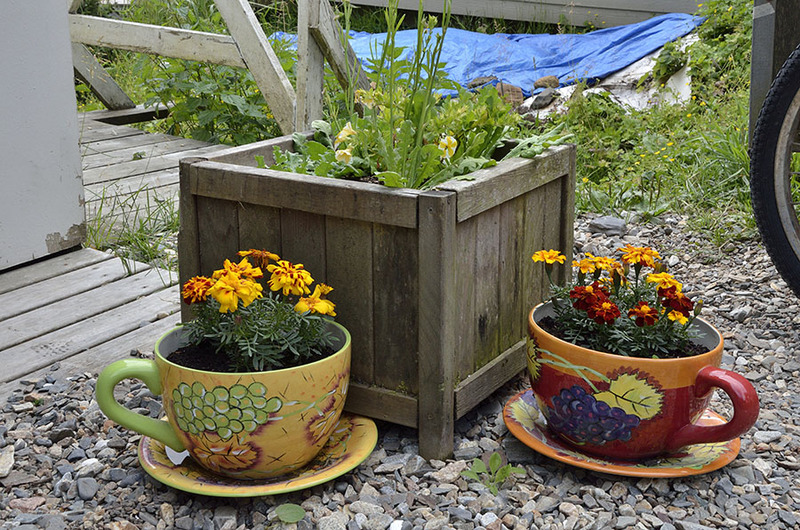 We prefer the more flexible and private setting at Baranof Warm Springs so we didn’t partake, but we enjoyed walking down the little main “street” (dirt road) and seeing everyone’s flowers and gardens. In addition to the hot springs, Tenakee is known for the ATVs that everyone uses to get around. Even the ambulance and “fire truck” are ATVs. 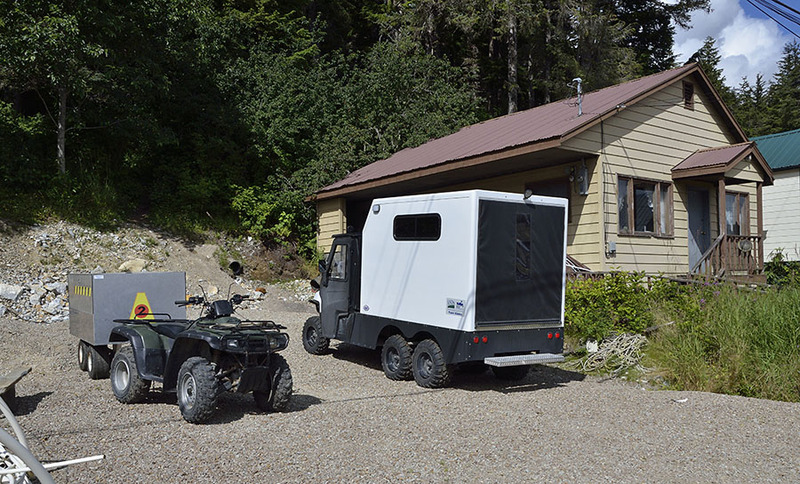 The ambulance is the boxy ATV on the right, and the fire response is the trailer behind the ATV on the left. There’s also a fire house – we’re not sure what’s hiding behind the funny garage door. 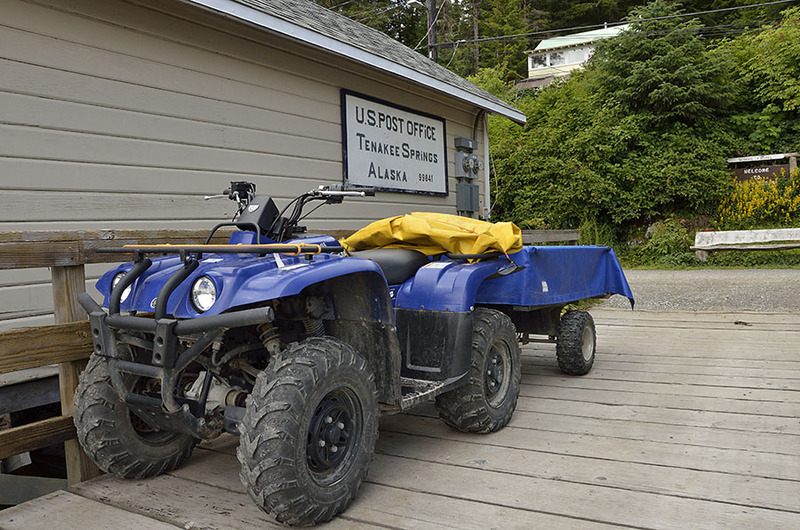 The Post Office in town also has its own Postal ATV, which is parked right next to the seaplane dock and the helipad. 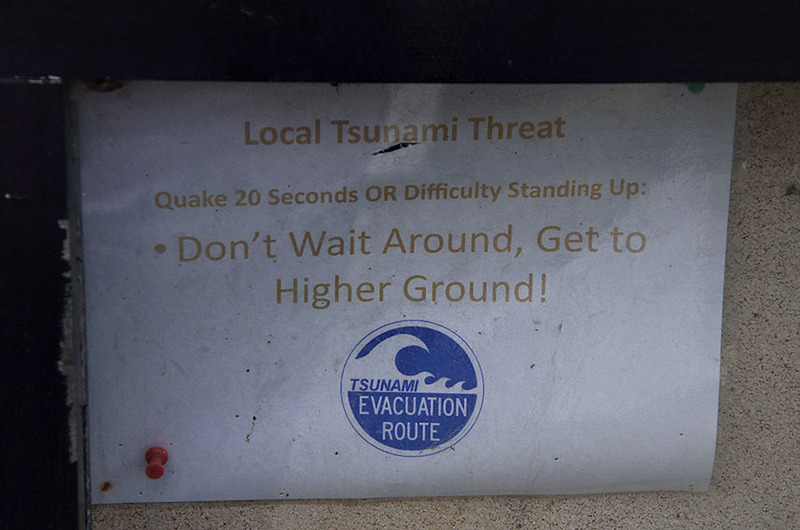 I’m not sure how much of a real threat of tsunami there is in Tenakee, but we appreciated the sign on the community bulletin board: We found a very small grocery store stocked with all kinds of fabulous gourmet treats, as well as a large shed with an open doorway that serves as a community book, video, and clothing exchange. The bakery in town is famous for its cinnamon rolls, and of course we docked right after they closed, so we delayed our departure in the morning so we could get some fresh hot treats – first out of the pan! From Tenakee we headed back out into Chatham Strait and then turned west into Peril Strait – a not very perilous place to travel, though there are some strong currents in a few spots that require attention, and one place where we have to wait for slack current to pass safely in order to get to Sitka – our next port of call, and a place where we can restock groceries and enjoy some meals out. Doesn’t look like much as changed in Tenakee, maybe the ATVs are newer & you had the opinion we did about the hot springs! Enjoy Sitka! Heading back to the boat in PT Tues., yeah!